Most analysts spend more time searching for information that may be relevant to their analysis than on the analysis itself. Too much time spent on the front end translates to inefficiencies and delays in answering critical business questions and, in turn, implementing the actions that can improve your bottom line. And often, others in the organization have already collected the same information or performed a similar analysis, but analysts have no good way of finding it. Data assets and resulting information proliferate, thus compounding the problem and creating inefficiencies and delays in answering critical business questions. 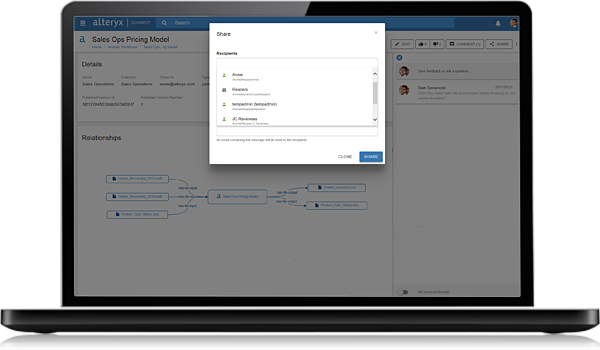 Alteryx Connect changes how analysts discover, prioritize, and analyze all relevant information in their organization. It is the beginning of a thrilling analytic experience that combines the power of data cataloging with human insight, and empowers analysts to quickly and easily find, manage, understand, and collaborate on the information that resides in their organization. Now, analysts can accelerate the end-to-end analytic process to dramatically improve analytic productivity and information governance, thus generating better business decisions for all. Better data leads to better decisions. Alteryx Connect is the guide to all of the information assets in your organization that, if used wisely, can unlock your competitive advantage. Discover the types of information your data contains, where the information comes from, who is using it, and how it is used through highly social interactions. Use powerful search capabilities to find and reuse information contained in analytic apps, workflows, macros, visualizations, dashboards, data science models, and more. Reduce the time spent searching for impactful data and assets, and avoid ones that have been rated poorly by others in your organization. Connect colleagues to governed data, analytics, and other information. 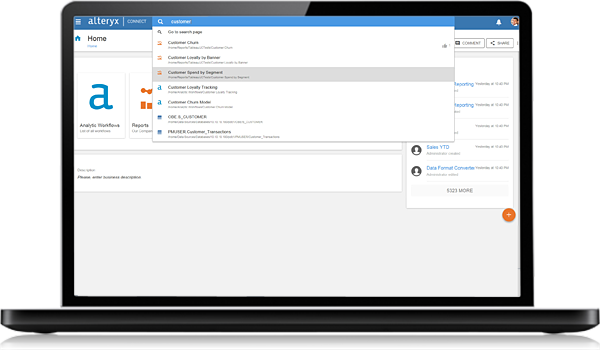 Alteryx Connect enables you and the teams you support to connect to relevant data assets quickly, and explore the data to gain context, so everyone clearly understands data lineage, quality, and certifications. Direct everyone in your organization to a common place to find, share, and collaborate on data, and minimize duplication of effort. Provide insight into data lineage and how information is being used to improve the overall quality and reliability of information being shared throughout the organization. Support your organization’s need for fast and easy access to relevant information by using familiar social tools to annotate, discuss, and rate information. The Alteryx platform is the only place to get data cataloging combined with best-in-class data preparation and advanced analytics so you can focus on the task at hand, not moving data from one tool to another. 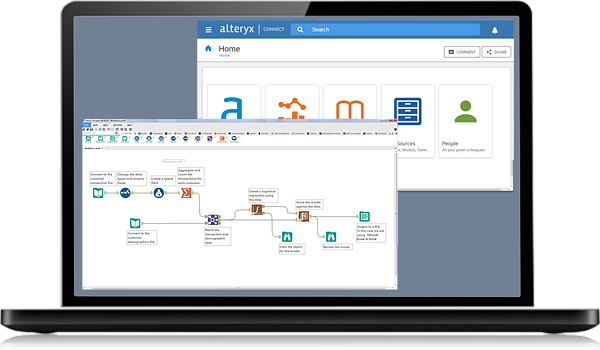 Utilize Alteryx Connect as an add-on to Alteryx Server to fully realize the potential of self-service analytics and leverage data to drive a competitive advantage. Leverage existing Alteryx analytic workflows to get detailed insight into how data is used and the way in which it is consumed. Utilize Alteryx Connect as the starting point to an analytic experience that is social, engaging, powerful — and fun. Administrators can load metadata into Alteryx Connect from the following sources. Ga zelf aan de slag en ervaar het gebruiksgemak en de snelheid van Alteryx met datapreparatie en -modellering . Download gratis de 14 daagse proefversie. We helpen je snel op weg met Alteryx. Onze officieel gecertificeerde Alteryx trainers kunnen niet wachten om jou binnen no-time een datahero te maken. We helpen je op weg, inspireren je en bouwen samen aan een oplossing. Wij ondersteunen bij het bouwen maar helpen je ook om zelf waarde uit je data te halen! Met onze markt- en productkennis ontwikkelen wij zelf solutions om het werken met Alteryx nog efficiënter en gebruiksvriendelijker te maken.